In The Everlasting Man G.K. Chesterton wrote that you can return home either by never leaving or by traveling around the entire world until you arrive at the starting point. Collin has traveled a long way (figuratively and literally) since his debut poetry collection, Better To Travel, and his latest book, Render, might as well have been subtitled Better to Stay Home, because Collin takes us back to his very birth and guides us through a poetic photo album that’s a showcase for more than careful poses and “cheese”-activated grins. The meaning of the book’s title becomes obvious when you see that the cover image depicts the author (tellingly) out of focus behind a large-format studio camera. Collin is a meticulous metaphorizer, so, of course, Render’s divided parts are named accordingly: reticulation, aperture, blowup and resolution. (Not that there aren’t double meanings to them.) 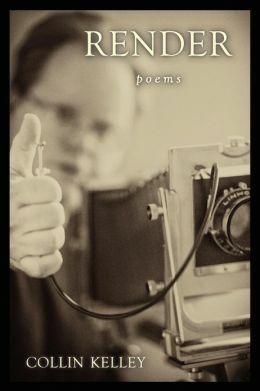 Finally, the concluding poem, which shares the book’s title, is written for photographer Sally Mann. Its poetic stanzas are interspersed with instructions on how to render a photograph, and the closing lines could have been used as a caveat for the reader at the beginning of the book: “Note that a blue sky and clouds are impossible to render/Expect imperfections and subtle debris.” Clever move, Collin. “To Margot Kidder, With Love” provides strong evidence of this shame by revealing that Collin (“in need of rescue” at the age of ten) was regularly dropped off at the movie theater so as to keep him clear of his mother’s trysts: “I pretended not to care what my mother was doing,/but I was cashing in part of my childhood to keep up the charade…” His weekly movie choice was Superman, and he related to and was comforted by actress Margot Kidder (“my surrogate”), who played the ever-imperiled Lois Lane. Collin’s affinity for the actress is a primary example of his tendency to identify with female icons, such as Judy Garland, Farrah Fawcett, Pam Grier, Debbie Harry and Wonder Woman. [S]he would never be the same again. This was only a test, Ian, to see if I could use my power. Like Valmont, stripping away your virginity, your God blinders. were intercepted on the downstairs extension. shelf and found my first addiction. the roof of my mouth, I was hooked. and I’m too tall and wide to follow. but there was no magic in those rough, twisted fibers. I hear my father stir. I tried, I say through the open door. I hope that Mr. Kelley managed to read Render, for it portrays him in a very sympathetic light. He was a man whose “work ethic/[kept] him out of the house and underpaid,” who was loving enough to spray-paint a rope to make it look like Wonder Woman’s lasso, who supported reconciliation of the marriage despite the harsh trials it suffered. This isn’t to say that I’ve no sympathy for Mrs. Kelley. No, in spite of the multiple reminders of her adultery, I left the book with a very soft spot for her. By the time I got to the middle of “Broken Things,” a poem that just kills me (not in the funny way), I was more than ready for her absolution. The human heart is a volatile, tricky, tragic thing, after all. This fact should be self-evident. that I have forgiven her, and I have. place my finger over the change slot in his head. How utterly sweet. Indeed, the boy was “in the middle, a counterbalance” – and he saved the day, not Barney. This poem is one of the many reasons Render is my favorite of Collin’s books so far. While I enjoy many writers for their style over their content, the content of this book shines brighter for me. Though there were some rough spots, and a smudge tool would have helped, this is his clearest work. I appreciate his candidness, his exposure, his resolution. Going home isn’t easy; sometimes it can be downright painful. But how forgiving and lovely those family photos can be.